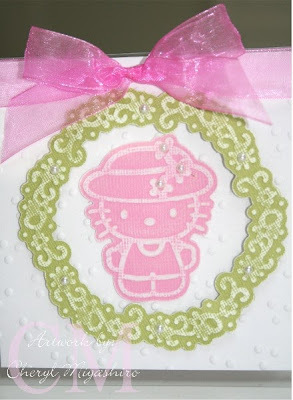 I'm really enjoying using the Hello Kitty embosslits from Sizzix to make cards. They are so easy to use! I picked up one of the new spring dies that just arrived in the store last week. This one is called Hello Kitty w/bonnet. It's much bigger than the ones that were released for March. As you can see, this one cuts out and embosses the flower wreath and the kitty with the bonnet. If you look closely, this is an acetate card. The flower wreath is on the acetate and the Hello Kitty is under the acetate and attached to the white textured embossed card. I tied both together with a sheer ribbon. You can probably see it better in this photo. I finally finished my card swap card last week and my partner should be getting it sometime this week. I still have to post the card that I received and all I can say is that it made my jaw drop! I hope to have it up tomorrow. Well, thanks for stopping by tonight and sorry this is short but my fave tv show just started and I need to go watch it. so cute! I was debating on buying this one! you did a great job and I love how you used the acetate too! this card came out so great! can't wait to see what more you create with these new sizzix dies!